Can I Drink Smoothies When Sick? When you are sick, you may desperately search for a treatment that helps alleviate your symptoms so that you can function. Smoothies are typically associated with good health because they are often packed with fresh fruits or vegetables. You may find the symptom reduction power you seek in a smoothie, depending on what ingredients you include and what ingredients you leave out. Smoothies have been around for decades, but have recently reemerged as a health food. Multitudes of smoothie cookbooks and smoothie shops boast the health benefits of drinking fruits and vegetables. Smoothies that include fresh fruits, fresh vegetables, 100 percent juice and low-fat yogurt are nutrient packed and may help boost your overall health. Other smoothies contain frozen yogurt, ice cream, sorbet and other sugary ingredients, decreasing their nutritional value. They should be consumed only as an occasional treat. You can drink smoothies regularly to help boost your overall quality of health. If you are sick, add smoothies to your diet to help ease your symptoms and provide your body with the nutrients it needs to heal and recover from illness. 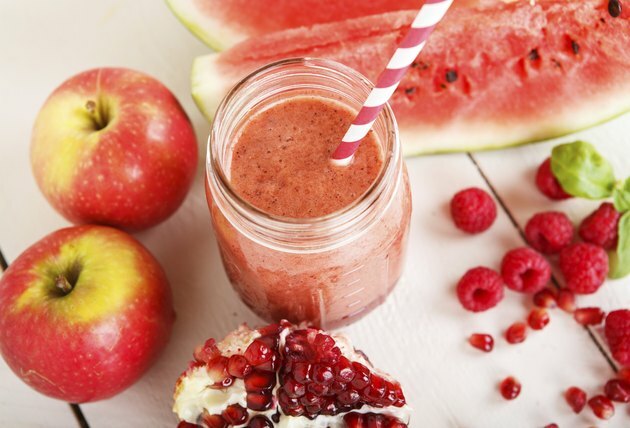 MedlinePlus notes that if you have a serious illness, smoothies can increase your calorie intake, helping your body fight off the sickness and providing you with strength and energy. The cool temperature of a smoothie may also soothe a sore throat. If you are vomiting, however, you should not drink smoothies. If you can not keep food down, MedlinePlus recommends only drinking clear liquids. If vomiting persists, see your doctor immediately. The nutrient content of smoothies may help your body fight off illness more easily by boosting your immune system. If your smoothie includes citrus fruits or strawberries, you will get a healthy dose of vitamin C, which is a nutrient crucial to immune function. Vitamin A, present in cantaloupe, apricots and oranges, also boosts your immune system so that you may be able to fight off illness more effectively. Pass on sugary ingredients, such as sweetened frozen fruits and ice cream, because sugar may suppress your immunity, making it harder for your body to fight off illness. Mary Corpening Barber and Sara Corpening Whiteford, authors of "Super Smoothies: 50 Recipes for Health and Energy," report that smoothies with vitamin C may help you feel better and that smoothies with ginger can help ease nausea. For a dose of vitamin C, blend 100 percent orange juice, fresh strawberries and low-fat plain yogurt in a blender until smooth. Add a sprinkle of dried ginger for taste and to help reduce nausea. A combination of 100 percent pineapple juice blended with banana, kiwi, papaya and plain yogurt is another smoothie that packs a vitamin C punch. What Are the Health Benefits of Blueberry Smoothies? Are Fruit Smoothies Good for You?